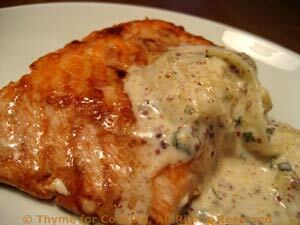 Thyme for Cooking's Main Courses: Beef in Beer, Baked Salmon, Enchiladas. The creamy yogurt takes a bit of the heat and bite out of the hot mustard, giving subtle flavors to the sauce. We prefer salmon filets. They may not make as nice of a presentation as steaks but they cook more evenly and are boneless. Heat oil in a small saucepan over medium heat. Add shallots and sauté for 5 minutes. Add wine and mustard seeds and boil, uncovered for about 3 minutes. Mix should be reduced by about half. Add mustard and tarragon and bring to boil. Remove 2 tbs for basting the salmon. Stir yogurt into the remaining sauce. Cover and keep warm. Put salmon on foil-lined baking sheet. Spread reserved mustard/wine sauce on top. 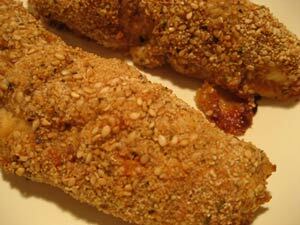 Bake at 400 F for 10 - 15 minutes, until top is light brown and fish flakes easily. It's okay if slightly translucent in the center. Serve with Mustard Sauce on the side. I cooked the beef for 90 minutes and it was meltingly tender. I used sirloin, but you can use a cheaper, tougher cut and braise a bit longer if you want, another 30 minutes. The beer does an excellent job of tenderizing. This is a traditional dish from Flanders. Cut beef into 2" (5 cm) cubes. Heat oil in a heavy pot or Dutch oven with tight-fitting lid. Add beef and brown on all sides, about 10 minutes. Add half of the beer and stir. The beer has a tendency to foam up so mind it carefully for about 5 minutes. When it seems to have settled down, add the rest of the beer. After it settles down again, add bouquet garni and mustard. Heat oil and butter in a large, nonstick skillet over medium-high heat. Add onions, reduce heat to medium and cook until tender and starting to brown, about 20 minutes. Add brown sugar and cook another 5 minutes, until caramelized. Add vinegar and cook until almost completely evaporated. When done add to beef and stir to combine. Increase heat under sauce and add half of the cornstarch, stirring until thickened. Add more cornstarch if you like a thicker sauce. Pour some of the sauce over the beef, serve the rest on the side. Using both green chilies and pimiento adds plenty of 'chili' flavor but without the heat. Add some fiery peppers if you like, the yogurt and avocado are there to temper it. Cut the chicken into bite-size pieces. Chop the onion and celery. Drain the chilies and pimiento. Roughly chop chilies and pimiento if whole. Heat 2 tsp oil in medium nonstick skillet. Add chili powder, onion, garlic, celery. Sauté until onion is tender and translucent, about 5 minutes. Add chicken and sauté until chicken is cooked through. Add green chilies, pimiento, 1/4 cup shredded cheddar, 1/4 cup yogurt, and mix well. Brush the remaining 1 tsp oil in a baking dish large enough to hold the 4 enchiladas. Heat a large nonstick skillet, over medium heat. Warm one tortilla in the skillet for 15 - 20 seconds. 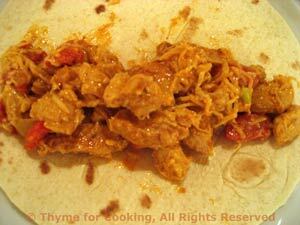 Spoon one fourth of the chicken mixture onto the tortilla and roll up. Place seam side down in the oiled baking dish. Repeat with remaining three tortillas. Pour sauce over the top - how much depends on your taste. I use 1 jar now and the rest as additional sauce at the table. Sprinkle with oregano and cheddar. Cover with foil and bake at 400F (200C) for 20 minutes, until heated through and cheese is bubbly. Cut avocado into cubes. 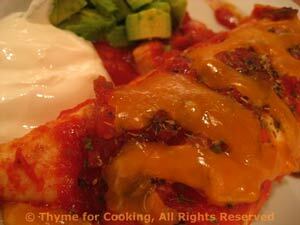 Put 2 enchiladas on each plate, add half the avocado and half the remaining yogurt. 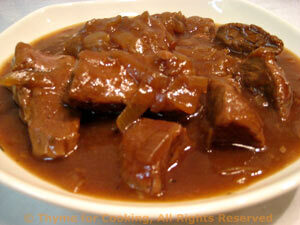 A classic, and so easy to do - using all fresh ingredients or leftovers from a Boiled Dinner. Cut potatoes and carrots into large bite-size pieces and steam for 10 - 15 minutes over medium-high heat, until vegetables are just tender. Chop onion, celery and mince garlic. Roughly chop enough cabbage to equal 1 1/2 cups. Cut corned beef or ham into bite-size pieces. Heat oil in a large nonstick skillet over medium heat. Add onion, celery, cabbage and sauté until tender, about 7 minutes. Cover, reduce heat and let cook for 5 minutes longer or until potatoes and carrots are done. 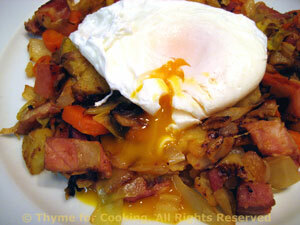 Add potatoes, carrots, beef or ham, to skillet, increase heat to medium, and let fry, undisturbed, for about 7 minutes. Then turn/stir, spread back out and let fry, undisturbed, for 5 minutes. Repeat, turning and frying until it is as golden and crispy as you like it. When it's done to your liking, reduce heat and poach eggs. Fill a large skillet with water. The water should be at least 1 1/2" (4cm) deep. Heat water over medium-high heat. When water is softly boiling reduce heat and poach eggs: one at a time break egg into a small saucer. Swirl a spoon in the water where you will put the egg - off to one side. When water is swirling drop egg into center. With slotted spoon try to keep the white together. With regular spoon scoop some hot water over tops of eggs. Poach for 2 - 3 minutes or until white is set but yolk is still very soft. Remove eggs with a slotted spoon and put on hash. Put half of the hash on each plate and top with a poached egg. There are a lot of intense flavors in the sauce for these chops; best served with simple side dishes. The sauce is reduced at the end, to thicken slightly. In a nonstick skillet large enough to hold the chops, heat the oil over medium-high heat. Add chops and brown, 3 minutes per side. Mince garlic, add to chops and sauté briefly. Mix remaining ingredients and pour over chops. 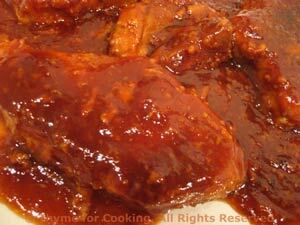 Reduce heat to low, cover and simmer until pork chops are done and tender, about 20 minutes. When done, put chops on a small platter and cover with the pan lid. Increase heat under skillet and boil sauce for 2 - 3 minutes, to reduce slightly. Spoon sauce over chops and serve. These have a lovely, crispy, crunch with a surprise Teriyaki flavor. I cut each breast into 2 or 3 long strips. They bake faster and have more 'crust'. If you prefer, you can just use breadcrumbs without the sesame seeds; and spray them with cooking spray, if you have it, rather than drizzling with oil. Cut chicken breasts into 2 or 3 long strips each. Using 3 flattish bowls: put the flour in one; whisk the egg and Teriyaki in one; mix the breadcrumbs, garlic and sesame seeds in one. Lightly brush a baking sheet with oil. Using your fingers, roll each piece of chicken in flour; then dip in the egg, coating all sides (let drain a bit); then roll in the crumbs. Lay on the baking sheet. Drizzle remaining oil over top. Bake in 400F (200C) oven for 15 - 20 minutes, until golden and crisp.